. . . . the road began to get rough and it was a lot of work to manhandle the bike. The road deteriorated more and more, progress in second gear was slow. After 20 tedious miles I was getting tired and knew I had made a mistake somewhere, but had no idea where. Another 10 miles of winding first gear mountain roads and I began to become concerned that the road would not improve and might dead-end. I stopped several times to consult my map but it did not reveal any paths I may possibly be on. Soon the road really turned to hell, was very steep, loose, and rocky and winding all over the place. Not knowing where I was I decided to backtrack to the last fork and hope it would be a bit smoother. Back through the mountain passes I was breathing heavy and beginning to be upset – I wanted to get to San Juanico and it was still a long long ways. 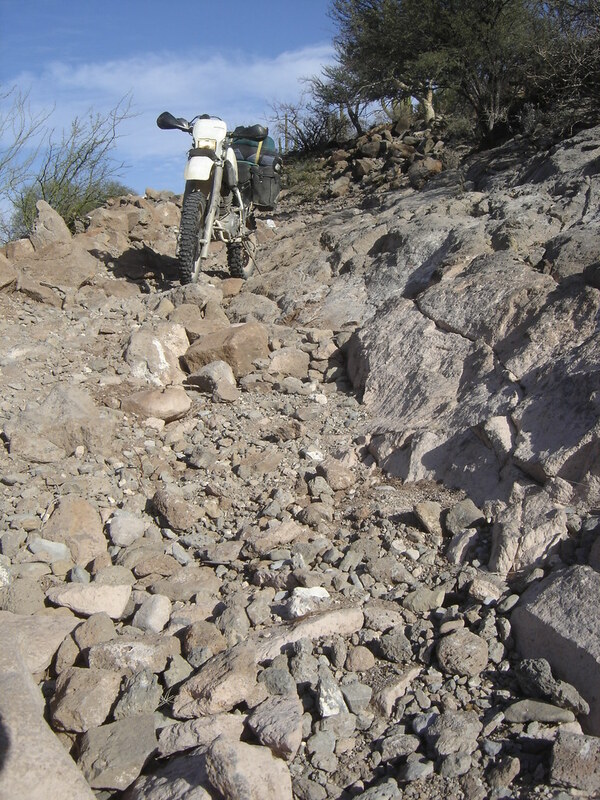 While turning down another similar road I dropped the bike in deep sand and it sputtered out. I immediately knew this was going to be trouble. The ground was soft, sandy and loose, and I was at the bottom of a hill in each direction. I peeled off my gear and prepared to push. In this terrain the bike’s front end just sunk in when pushed. there was no way I’d build up enough speed to get it started, let alone the traction. I futilely fought the bike for 30 minutes in the blazing sun pushing with all the strength I could muster. I was simply not fast enough, strong enough, and the rear wheel did not have traction. 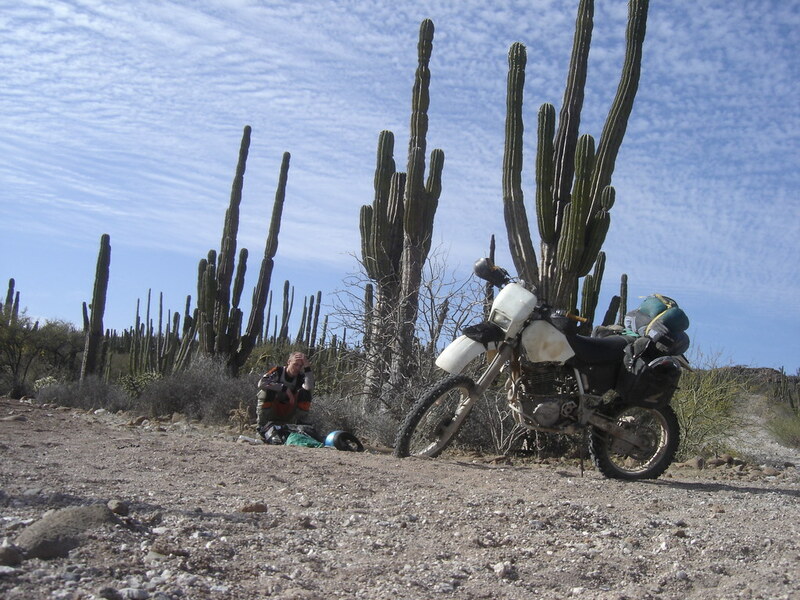 Fatigued, panting, dripping in sweat and insatiably thirsty I reached into my saddlebag and felt around for the half gallon of water I brought with me. It was around 2:30pm, I had been on the road for over 5 hours and had hardly covered any miles. When pulling the bottle out of the bag the cap dislodged and the entire bottle dumped into the sand. No more than a tablespoon made it to my mouth, and little did I know…. my day was just beginning. . . It was at this moment I noticed my lucky AZD cup had fallen off the back of the bike and was nowhere to be found.